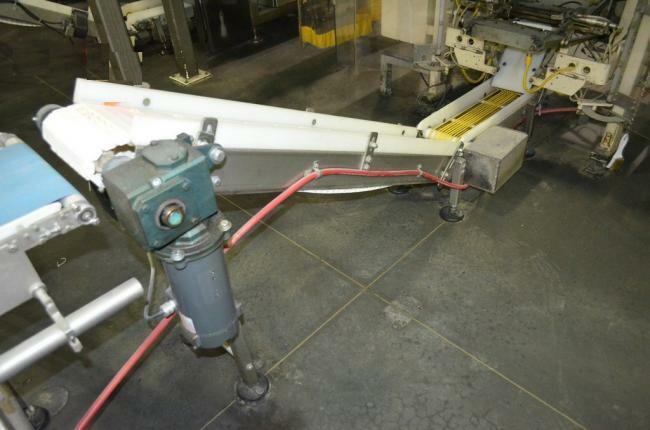 Used 8 in x 66 in Stainless Steel Frame Incline Belt Conveyor for sale!! This incline takeaway conveyor is perfect for and VFFS packaging machine application. It has a horizontal belting style conveyor so any loose product can be collected and not be taken up the conveyor if any finished bag is not sealed properly. There are photos eyes attached to the conveyor to be connected to a checkweigher for timing the product properly. Take a look at our Loma LCW 3000 Checkweighers. They work perfectly with these conveyors.